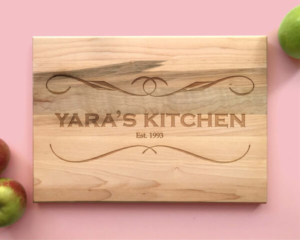 Personalize your wood cutting boards using our templates in which you can easily place names, dates or logos. We have many great templates for you to choose from, whether it’s for your home, business or a special occasion. We cater orders to individuals and large bar, restaurant, hotel, and hospitality chains looking for a beautiful addition to their home or business. An engraved gift with multiple possible designs to commemorate every occasion. Made with rich Canadian maple to complement your kitchen, bar, restaurant, or hospitality chain. You can also add our cutting boards to a gift basket. What better addition to a fruit and cheese basket than a custom cheese board personalized for your friend or loved one? Our goal is to provide beautiful personalized cutting boards that will be a welcome addition to the kitchen in your home, add flare for your bar or restaurant, and elegance for your hotel or hospitality chain. At cuttingboard.ca, you don’t have to sacrifice quality for style! Our engraved gifts are fun, attractive and built to last. Melding form with function, our custom cutting boards are great for chopping food or serving guests your home, bar, restaurant, or hotel. Everyone needs a cutting board, so they’re also a fantastic and fun idea for a gift basket or present! 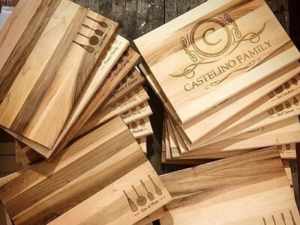 Browse our selection of customizable cutting board templates to see how you can bring a stylish touch to your kitchen, bar, restaurant, hotel, or other hospitality venue that you can call your own! Like any good promotional gift, a custom cutting board puts your brand in front of your potential customers every day. 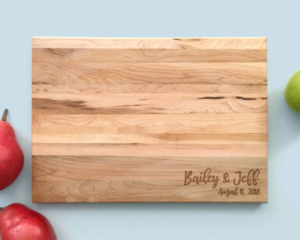 A brand personalized cutting board can be a gift to a loyal client, a bonus for signing up for a service, or something you can distribute as prizes to potential customers. 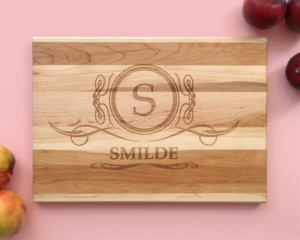 However you choose to use it, the brand personalized cutting board will put your name in front customers and potential customers every single day. When they’re preparing dinner, or serving on their custom cheese board, your client and their guests will see your name in front of them. It’s this functionality that makes our custom cutting boards such fantastic promotional products! Personalized cutting boards are also ideal for hotels, bars, and restaurants! Stylish and functional, an engraved cutting board is the perfect way to serve your guests and promote your brand. We can place your logo or name on one of our custom templates, giving you a tasteful means to promote your brand right at the table. We happily accept bulk orders and can help you find a unique way to make your restaurant, bar or hotel stand out to your valued guests. Our cutting boards are made with rich Canadian maple, which is both attractive and durable. Our boards can be used for cutting meat, bread, cheese, or vegetables. They also make an elegant kitchen or restaurant decoration that can be hung on your wall, adding a fun dash of personality to your kitchen. A personalized cutting board from cuttingboard.ca is made with 100% Canadian maple, so you can expect it to last and be easy on your knives. A custom cutting board is both functional and attractive. While they are practical in the kitchen, they also serve as a nice display piece for serving your guests. Use your custom cutting board as serving tray that will grab your guests’ attention and be a great conversation starter. Perfect for serving cheese, vegetables, or bread. With our custom designs and your personal touch, you’ll be proud to display your cutting board to your guests. A personalized cutting board is a fantastic gift for your major life events. 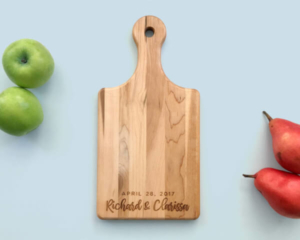 Giving an engraved gift makes a statement of your personal connection that will last the lifetime of the cutting board and beyond. Every time your friend, family member or client uses the board, they’ll be reminded of you and your thoughtful gift. It’s this functionality that makes the personalized cutting board into a gift they’ll use again and again. Custom cuttings boards are a great wedding gift idea, and are a fun and functional gift for the groomsmen or bride’s maids in your wedding! They are a perfect house-warming gift and are great for birthdays, Christmas, or any other life occasion or milestone. Choose a custom wood cutting board for the cook or chef in your life and let them know you care every time they prepare dinner! Check out our selection of personalized cutting boards to find the unique gift that’s just right for you or your friends and loved ones! We supply the Canadian hospitality industry and have proudly partnered with restaurants, hotels, and catering companies. If you are looking for a wholesale cutting board supplier, you have come to the right spot. Request a quote today, and one of our customer service representatives will be in touch with you shortly. We have a large variety of standard cutting boards, butcher boards, serving boards, and specialty boards.